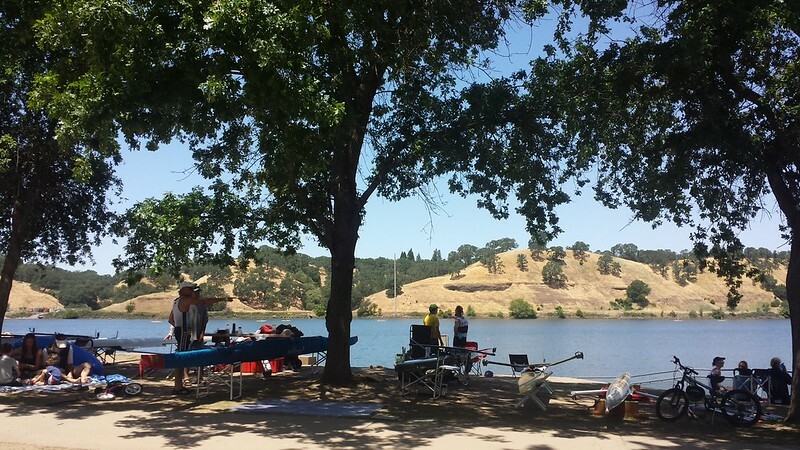 Gold Rush Regatta: It was so wonderful to see so many rowing friends, and get to hang out at the races with J and K. I'm relieved that our boat rental situation worked out, though the racing itself was something of a mixed bag. Both the quad and the double that we rented had toe steering, which is where the bowperson controls the rudder position by changing the angle of her foot. Toe steering is extremely helpful for head races on winding courses, especially for boats like quads. But it also adds drag, of course, and isn't really necessary for a straight 1k race. In addition, since they don't have much practice with it, the toe steering made J and K freak out a little. In our quad race, it caused us to overcorrect and ping-pong our way down the course, which probably contributed to finishing 0.5 seconds behind second place. Darn, but oh well. Next up, J and K fought the toe steering in their 2x event. Then it was finally time for my 2x race with K, followed by a stressful hotseat into the 1x for me. K was still stressed out and fussing over the toe steering, and tried to tighten everything down so it wouldn't move at all. Well, that failed, and as we warmed up she discovered that she had to keep her foot at an awkward angle to get the boat to run straight. No good. So I finally realized that what we needed to do was to loosen it up so it could run free. A few microadjustments after that and we were in MUCH better shape for the 2x. I think we got second or third place in that race and had a nice, solid race. K's back to talking about buying a 2x again because she's tired of dealing with shoddy team equipment. Hotseating into the 1x was slightly less graceful. The things I will take away from that race (last place for me, oof) are that it really is time for me to get my own oars, and that I really do need to step things up in terms of core strengthening and balance. The Hudson was as good to me as it gets, but the shift from the 2x to the 1x was big and I felt super sloppy in the 1x. I was just a short distance behind the boat in the lane next to me, and as we crossed the finish line she turned towards me and declared, "Time for a beer." I mean, yes, but ugh/oof. I'd like to be at least a little bit better than that. I felt a little silly about having S haul out the 1x for me from Berkeley for such a poor performance, but on the other hand it was wonderful to have a chance to catch up with him on the ride back to town, and then I felt really helpful when it came time to unload all of their boats in windy weather back at BPRC. That reminds me that he encouraged me to check out the Green Mountain Regatta in Vermont. Looks fantastic to me. Between now and then, I think I'm going to kind of hunker down and try to get myself into a reasonable fitness routine. I am making scrottie go on Friday night late night bike rides with me, as one thing. I'm hoping to build up to doing the Midnight Century route, so that I can reach New York with a good base for a brevet or two, hopefully.